For years and years our Christmas celebration were the same – the same people, same food, same events and traditions. As our daughters got married, we made adjustments to continued with our treasured traditions. But our Christmas changed 4 years and so did I. Four years ago, my Mother was dying of cancer during the Christmas season. Somehow we had Christmas that year, but there was an overcast of sorrow that surround our traditions. I was anxious to put all of that behind us when the next Christmas came, but that was not to be. Our daughters spent Christmas day with their husband’s families (and rightly so, as the last year had been so focused on our family). Our Christmas day would be Bill, my Dad and I. On Christmas morning, my Dad and I spent time in deep conversation about how we were dealing with the changes of the past year. I was sad that Christmas was so different than it had been (no crowded house filled with family, no big meals, no piles of presents to open on Christmas Day, and missing my Mom ). Three months later the Lord would call him home. I now look back on that Christmas morning with thankfulness as that was the last Christmas with my Dad. I was ready to put Christmas back into place when the next year rolled around. It appeared that all the pieces would be in place for our annual celebration. There would be a sweet new baby (2 weeks old) join us. We gathered together and then shared the flu and one by one most of us went down. The yearly food traditions were requested to never be seen again. It was one of those horrible sicknesses that passes through everyone (except one son-in-law who did not get sick) and once again Christmas was a disappointment. 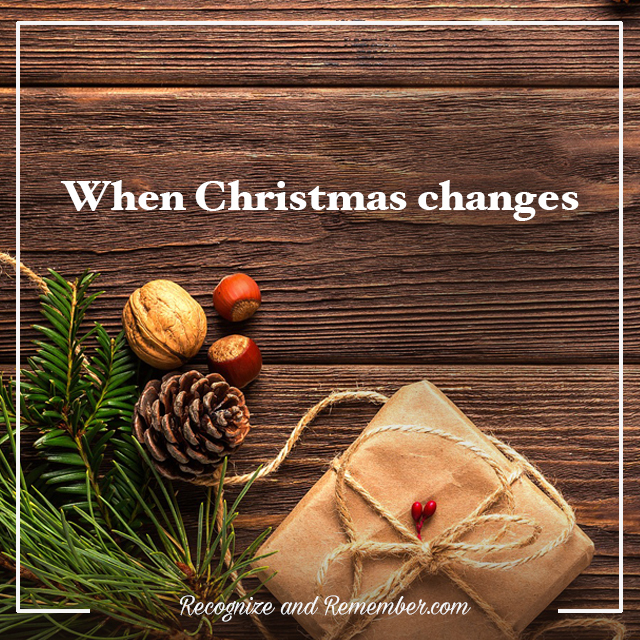 Last year it was time for a change – the annual Christmas celebrations of the past had to become memories. I asked the family how did they want to celebrate Christmas and the answer was overwhelming “BE TOGETHER.” The concern was not about the traditions. We did new foods (fondue – yum), enjoyed time together over a puzzle, played games and most importantly enjoyed time together. Bill and I spent Christmas Eve strolling through Phipps Conservatory enjoying the beauty of God’s creation. Nothing was the same and yet it was good. I learned that while traditions are a good thing, they have to change because families change, our life seasons change and nothing is meant to be forever this side of heaven. I find myself being much more open with my expectations now, working around the needs of our growing family and treasuring the moments God gives and being so thankful. I pray that no matter how your Christmas will be spent, you will lean into the changes that life has brought, let go of traditions that need to change and embrace the joys of being together.